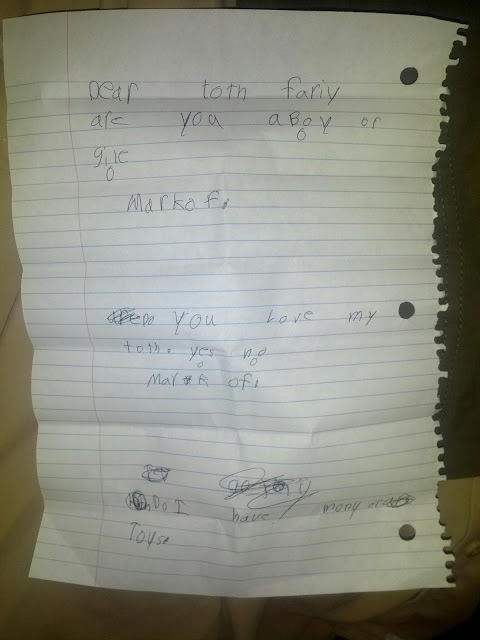 Our 7 year old lost her tooth... that's a bad word to use. She didn't lose it, she flicked it forward and noticed there was blood in her mouth. Anyway, after she got home she tried to keep the tooth under her pillow because "the boys would've gotten it" to which I reassured her that this wouldn't happen. So, in the process of putting it on her nightstand she had managed to leave a note along with it. Ain't imagination grand?! This morning she came down like she had solved the world's problems. "The tooth fairy is a girl!" she stated with one hand on her hip, the other hand jingling a bag of quarters. "AAAannd, she left me two bucks!" "How do you know she's a girl?" I ask trying not to reveal my true identity. "Look at her writing!" Like I'M the idiot! Well, I'm disappointed my "disguised" writing looks like a girl but I'm relieved that I wasn't caught. I almost giggled myself to death as she pointed out the letter that was now filled out with a smell-good #Tinkerbell marker.